And it was free this time! The best way to let someone know you have quality products is give them one. All the plans on this site are of equal quality. This design is intended for experienced box builders only. ...You're probably wondering what the magic angles are, and all the dimensions etc. Okay, here they are: 8", 4", and 2". These are the three magic numbers needed to layout this design, regardless of the optional size you choose to make it. Wait a minute, optional size? Yes, you have the option of making the length any size between 24" and 36" ! The formula that determines the layout will automatically self adjust for any of the optional lengths you might choose for your horn. Cut two panels 36" wide by whatever depth you want between 24" and 36". Lay one flat on your bench. The illustrations are a top view of the panel laying on your bench. 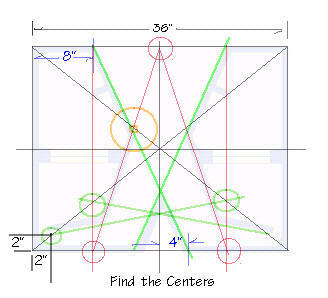 Take your tape measure and find the centers as shown. Draw these lines on your panel. 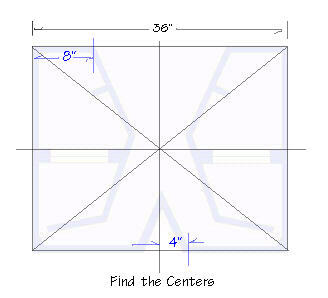 From the bottom center measure 4" in each direction and make a mark as illustrated in blue. From the top right and left edges measure 8" and make a mark as shown. (only one side is marked in the illustration to keep it from getting cluttered.) Remember whatever you do on one half you must do to the other half. This is a mirrored design. 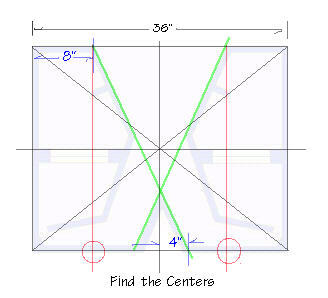 Draw an X on the panel by connecting your marks as illustrated by the green lines. As you can see, you now have the lines to lay out 10 panels leaving only 4 to go! Starting at the top, draw a vertical line on each side of the panel 8" from the edge as illustrated in red. Now draw two lines connecting the three points illustrated by the circles. You now have the lines for two more panels, only two left now! Notice the intersection circled in orange. 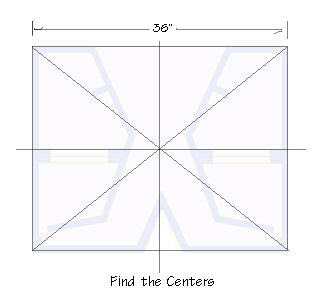 This point where two panels join should land on the original black X you drew when finding the centers. Following this point, like a road map, head North West on the black line and turn North (up) on the red line then back to the starting point on the green line. This triangle illustrates where to locate the stiffening strut on the panel, and shows the correct width to make it. 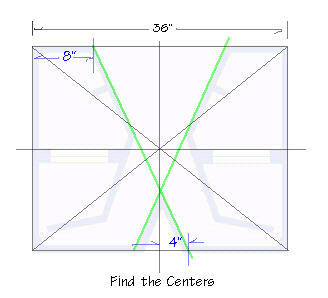 Measuring 2" from the lower corner plot and intersection as shown. This point determines the throat of the horn. Since you're using material that is 3/4" of an inch thick, the throat opening will be 1.25 x 1.25 inches when measured from the inside after the panels are in place. NOTE: Enlarging this opening to no more than double, will raise the high frequency cutoff point. Combined with reversing the speaker baffle 180 degrees it is possible when using higher frequency drivers to reach a cutoff of 5khz. This is desirable when using this design as a full range enclosure. Applications of that would include PA use and Home theater Center Channels. The green circles illustrate the last two intersections needed to plot the line for the last panel illustrated by the green line. You now have the layout to build your horn. As you can see, the formula will self adjust for any height between 24" and 36". Pretty neat huh.. This allows you to have some control over the physical size of the cabinet for reasons of woofer selection, i.e.. internal chamber volume, and placement. A direct parallel between the efficiency curve and the height dimension is eminent. The larger up to the full 36 inches, will be louder. The way to cut your panels that make up the rest of this horn is simply to cut several 48 x 10" or 48 x 12" inch pieces to work with. The 10 or 12" dimension is used for 8 and 10" woofers respectively. Take one of these stock panels and lay it on the large panel you just drew a crop circle on. Using your pencil carefully align the panel with the lines you drew and trace the other side so that you create a duplicate set of line 3/4's of an inch away from the original set. 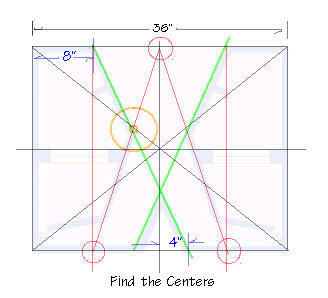 This way you can see exactly how your panels will intersect, and where to locate them. Now take a protractor, and decide how you want to join your panels. You may wish to end join them or miter them. The determining factor will be the abilities of your table saw. I recommend drawing the joints on your masterpiece too. That way you wont forget how you're planning to join each panel. You'll be pleased to find out there is a way to join the panels (end join) so that almost every angle in the design can be cut from one setting on your table saw. In other words, most of the angles in this design are identical, no matter what size you picked for the height of the enclosure. If you think this is getting rather amazing, wait until you hear the sound quality of the perfectly flat, extended response of this horn and the incredible efficiency! The baffle for the speaker should be double thick, although it is only a suggestion. Once you have cut it and placed it as shown in the illustrations (Notice it follows the original center lines) you may flip it over 180 degrees if you want. Do what moves you as the best way. If you're going for a full range response, it must be flipped. Final construction tip... assemble the angled panels to the bottom that you drew on with wood glue, and then hot glue the seams. This will hold you box together during assembly, but before you do that, you might want to transfer the design to the top, so that you can drill holes in the top every 4 inches over every single panel in the box. We use a rubber gasket glued to the top edge of all the panels to achieve a seal against the top. The holes are for screws so that the top can be removed for service. That's it! One of the most complex but rewarding boxes you'll ever make. I hope you appreciate the freebie, as these plans are compliments of myself, Steve Deckert, to illustrate the killer designs sold on this site. Naturally, although free, this information, and illustrations are copyright (c) 1996 by High Fidelity Engineering Co. and represent a design which is also copyrighted by High Fidelity Engineering Co. & Designer Steve Deckert 1996. "The Wicked One" is a registered trademark of High Fidelity Engineering Co. License is granted for the personal use of this information. No permission is granted for commercial reproduction of this enclosure design, including car audio road shops and installers for the intent of wholesale or resale.